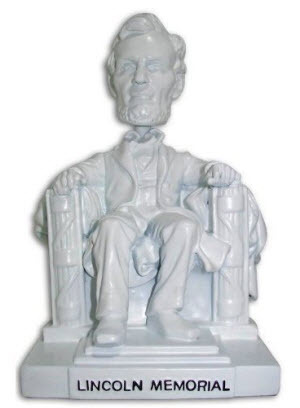 Lincolniana is Abraham Lincoln memorabilia and ephemera in a variety of formats, ranging from the serious and scholarly, to the outright silly and satirical. 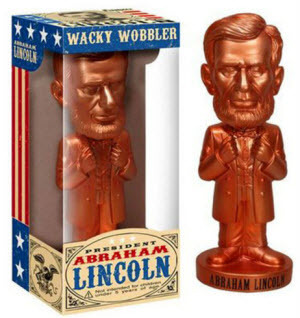 Here are some Lincoln collectibles that have Abe's head noddin': Abe Lincoln Bobbleheads! America's national pastime is baseball. Not only is Abraham Lincoln popular on baseball cards, he's also a mascot on the Washington Nationals baseball team. Naturally, he's depicted in a stadium give-away (SGA) bobble head from the game on August 18, 2007. You may also recognize the Mt. 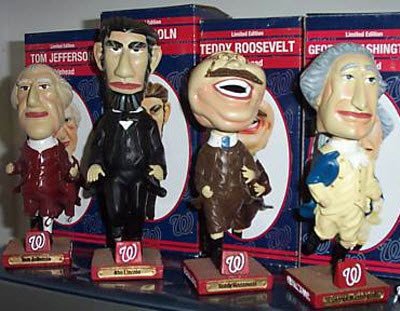 Rushmore theme here--there are four Nationals mascots: George Washington, Thomas Jefferson, Theodore Roosevelt, and Abraham Lincoln. The mascots race at Nationals home games--a real version of dot racing popular at other ball parks. Poor Teddy Roosevelt never wins a race. Impress your friends with this fact: Tom Davis, entertainment manager for the Nationals, says the presidential costumes each weigh 45 pounds. 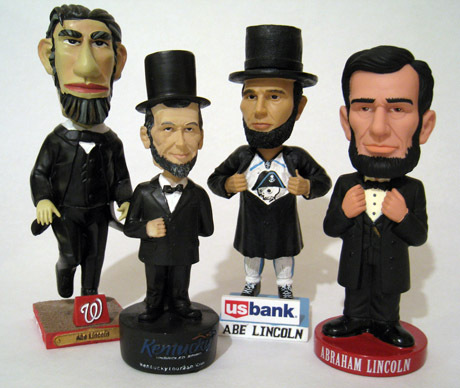 Other athletic teams have adopted Abraham Lincoln as their mascot, honoring him with team bobbleheads. 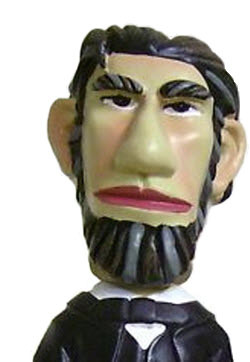 Here, for example, is a Lincoln bobblehead from the Lexington Legends. The Lexington Legends play in the South Atlantic League (minor league baseball). 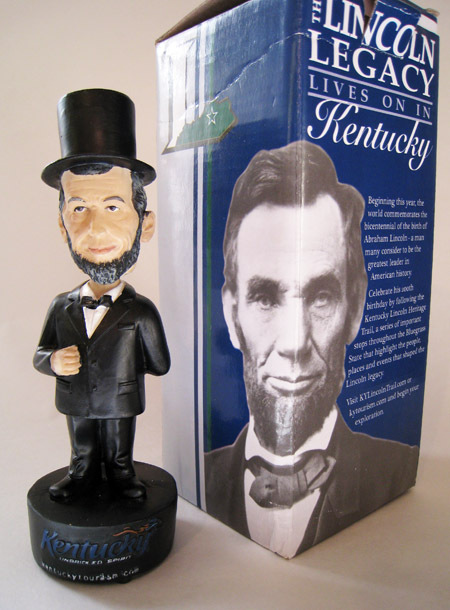 In 2008, they introduced the "Legends of Kentucky" series with the first bobblehead: Abraham Lincoln. (The 2009 winners were a little more exclusive to Kentucky--dual bobbleheads depicted Kenny Perry and J.B. Holmes, members of the 2008 Ryder Cup team.) 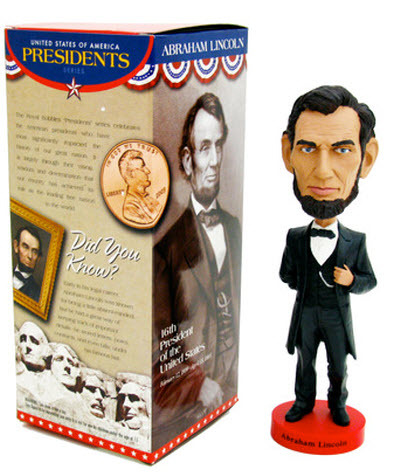 The Abraham Lincoln bobblehead was distributed to the first 1,000 fans in attendance on June 6, 2008. 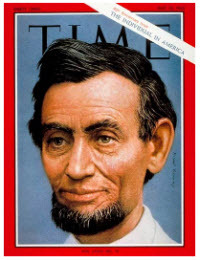 On February 12, 2010 (the 201st birthday of Abraham Lincoln), the Milwaukee Admirals hockey team played the Rockford IceHogs. 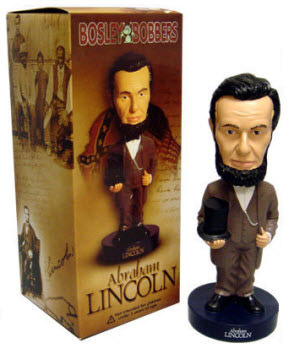 The first 5,000 fans got an Abe Lincoln bobblehead, who was wearing ice skates and was sporting an Admirals jersey. The bobblehead was sponsored by US Bank. One sold on eBay in September 2011, for $13.55. Another went unsold in late December 2011, with an asking bid of $23.99. Milwaukee Abe did sell in January 2012, for $19.99. Not only do the Milwaukee Admirals have a cool mascot, but they know their history, too. 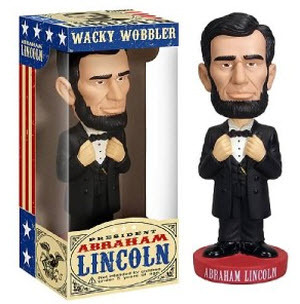 From their website: "Only the most dedicated Lincoln scholars know that, in addition to guiding the country through the Civil War, he was also a big Admirals fan. Some of Lincoln’s favorite Admirals include David Farragut, Charles Wilkes, David Porter and Nolan Yonkman." Bosley Bobbers also retired a Lincoln bobber, number 163. It also stood about 8 inches tall. 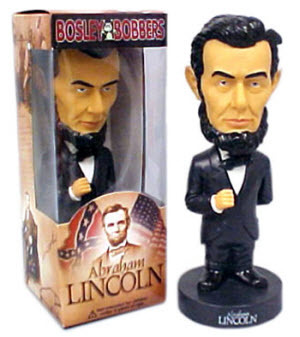 The Abraham Lincoln bobber seems to be one of Bosley Bobbers' most popular figures. After a fire destroyed the Ohio barn in which more than 100,000 bobbers were stored, along with the molds used to make them and original drawings of them, the Bosleys expected to receive the first shipment of bobbers, which included Presidents Abraham Lincoln, Ronald Reagan, and Harry Truman, as well as Pope Benedict XVI and Al Capone. What are bobbleheads good for if not for rocking out? The Hard Rock Cafe has immortalized Lincoln with Lincoln Monument and Abraham Lincoln guitar pins and now Lincoln, about 5-1/2" as seated in his monument, can nod is head to some good rock music. In fact, the Hard Rock is so cool, they even have Abraham Lincoln bobblehead pins! Copyright © 2005-2012 Alta Omnimedia. All Rights Reserved.